Martyn Booth will be known to many guitar players as one of the UK’s foremost repairers. Guitarist readers will also remember his highly detailed instrument reviews, but perhaps most will know him as the designer of Yamaha’s MSG guitar range that appeared between 1988 to 1991. So, with the partnership in place, Martyn set about re-designing the original MSG guitar – the first fruits of which are on review here. But who does what? “Well, Andrew does the bodies, the carving and the finishing, I still do the neck shaping, fretting and assembly and set-ups” says Martyn of this quite democratic labour co-operative. It really doesn’t take a genius to pull this guitar out of its Hiscox case and realise that it represents guitar building at its best. The Classic is also aptly named: there’s nothing here that will challenge you with forward thinking design or construction. It ‘s classic by name and by nature. “The idea behind the original MSG was to mix the classic lines of an ES335 with a Les Paul, but to make the guitar a lighter weight with better high-fret access and create a better sounding rhythm guitar. lt’s the same here but I also wanted to make it more graceful, a little smaller and quite definitively a custom built guitar.” To that end, you may remember that the MSG featured a top carving that was a little like a PRS with a flatter central section, this new guitar’s top carving is purposely more classic, more like an ES335 without that flatter central section. Under the sharp cellulose finish – a rich, sllghtly ‘bursted red-brown on the top and a not too bright Gibson-like cherry on the back, sides and neck – the wood and the jointing ls all very visible. It’s a good job then that the workmanship is faultless with sharp, clean joint lines. immaculate finish masking and scraping to the top’s edge creating the PRS-like ‘fake’ binding. There’s an (optional) rib-cage contour on the back and a generous radius to the back edges. Overall the body depth is fairly thin (slightly thinner than a PRS Custom at about 47mm) which immediately creates a comfortable, well-balanced and lightweight instrument on the strap. And speaking of straps, not everyone will enjoy the upper strap button placement on the underside of the compact heel, but that’s so typical of the ES335-inspired outline shape. “Of course, the beauty of the custom guitar concept is that, within reason, you can choose your own favourite neck shape along with numerous other details like, for example, the fretwire. Here the Dunlop wire is a tall medium gauge that makes the bendability smooth and effortless. The smoky black ebony fingerboard and bound edges are really tidy and the frets sit over the binding for maximum playing width. Only some very slightly sharp fret ends are noticeable, but Martyn rushed this guitar to us as soon as it was finished and would have preferred a little longer with it on the bench. And frankly they don’t impair the smooth, comfortable and positive feel. Needless to say, the set-up on this example was pretty faultless. The Tusq nut is neatly cut, the string height low over the 1st fret and the 12th (approximately 1.2mm on the treble side 1.5mm on the bass-side), while pick up height, not to mention the height of the tune-o-matic – and the intonation – are all perfect. At this price, of course, you should demand such excellence, but only with a customer order can you specify the exact set-up that suits you. Allhough the gold-plated Gotoh hardware – which includes the very discrete looking locking Kluson-style tuners – and the quilt maple help create an upmarket vibe, fingerboard decoration is kept to a minimum with some neatly installed abalone dots. The ebony-faced headstock bears a Martyn Booth ‘signature’ inlay, and the Classic model name (with quite a bold script that will be reduced on future models) is engraved on the truss rod cover. Of course, the pitched headstock is very Gibson-like, but an additional central hump to the top lip gives it a subtle visual difference. Although all sorts of electronic trickery could grace a custom guitar like this, the set-up on this model stays true to the classic design concept. Two gold-plated, covered Seymour Duncan humbuckers – a Jazz at bridge and a ’59 at neck – are simply controlled by a three-way toggle switch and master volume and tone network placed in a similar fashion to a PRS. The tone control has a push/push switch – which is much faster than a push/pull – which splits both humbuckers, voicing the inside (slug) coils of each humbucker. All the electronics are rear mounted in a neatly cut, screened (paint and foil) cavity, and the output jack socket is a barrel type fixed to the guitar’s side. It’s a faultlessly put together piece. If you’re expecting a huge, dark and thick Les Paul-like tone, you’ll be disappointed with this classic. Instead, the clean tone, while lighter than a Les Paul, adds some high-end snap and clarity to a very Gibson-like smoothness. Adding in some chorus and delay to this basic clean amp tone creates a classy modern rhythm tone that reeks of stylist versatility. Kicking in the overdrive channel, the Classic reminds us of an older 24-fret PRS Custom; there’s plenty of poke for gutsy bridge and neck work, though the sound remains less girth-some than a Les Paul. There ‘s good balance to the tones too, the bridge pickup has brightness but not too much sharpness and the neck pickup gives a flutey response underpinned with clarity. The single coil mode, which obviously adds hum and isn’t hum-cancelling with both pickups on, reduces the output for a stringier, slightly muted tone that’s a good place to start when setting up your amp. Aim for a rich Fender-like voicing, and when you punch in the full humbucker mode you’ll get extra power and squash delivered to your amp’s front end that’s ideal for solo excursions. Overall there’s a certain politeness (sophistication?) to the tone, but we suspect that’s intended. This is no nu-metal axe, it’s an altogether more mature and articulate voice, perhaps for a player who uses more complex chord voicings and scales. 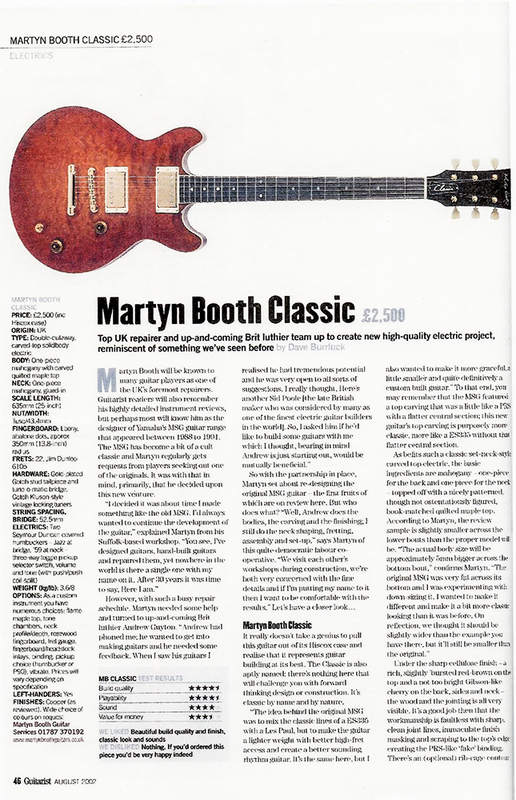 Martyn Booth’s aim was to create a classic guitar that matches the build quality of high-line instruments like PRS. Undoudtedly, and with the help of Andrew Guyton, he’s succeeded. But whereas options are limited on most production instruments, Booth offers a wide number of custom options (see Spec Check) that provides immense flexibility to the customer. The reviewed Classic is finely made with a sound and playability that really does reflect Martyn’s considerable experience. By design this is a serious guitar that offers classic, timeless performance unworried by the latest musical trends, fads or fashions. But because of the custom options, it’s a little difficult to be overly critical. For example if we preferred a bigger stiffer neck with an unbound rosewood fingerboard, perhaps nickel hardware and a less fancy maple top, we’d just have to ask when we placed our order. While fine acoustic makers seem to abound in the UK, few specialist electric builders can really match this sort of quality – not just in terms of build but also in terms of visual style and tone. Yamaha’s MSG may be long gone, but this Classic is a superior replacement that should satisfy players demanding the best, but who also want some personalised control over their dream guitar.